Eagle Law Offices Recognized For Legal Ability & Ethical Standards | Eagle Law Offices, P.S. A High Peer Review Rating is achieved through a vigorous process that is monitored and managed by North America’s most trusted legal resource, Martindale-Hubbell®. The Peer Review Ratings™ are an objective indication of an attorney’s professional ability and ethical standards, generated from evaluations by other members of the judiciary and the bar and in North America. 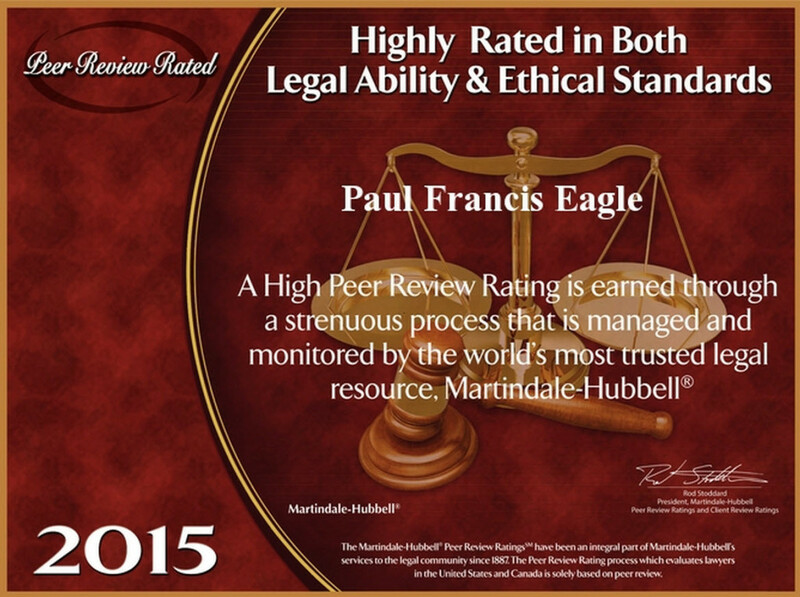 Martindale-Hubbell® Peer Review Ratings™ are a blend of a Legal Ability numerical rating and a Very High General Ethical Standards rating. In order to achieve a rating, a large number of responses must be achieved. To schedule a consultation with Paul at Eagle Law Offices, please call 1(877)579-0650.